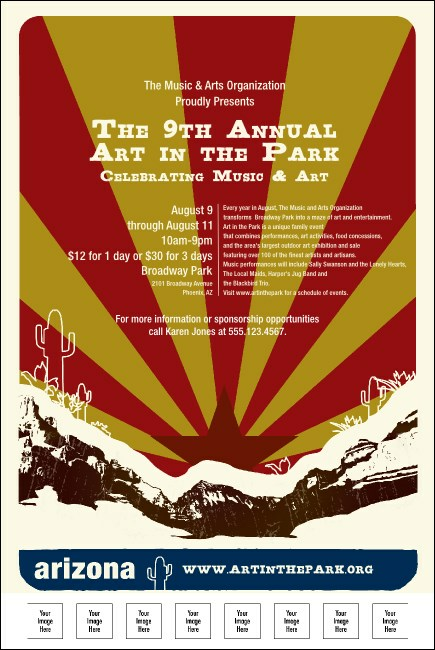 The desert communicates its own ethereal beauty, depicted here in our full color Arizona Poster. A high desert images pairs with the Arizona State Flag and five custom image uploads to help you communicate the stunning nature of your upcoming gathering in the Grand Canyon State with all the grace of nature. Worth a thousand words? Choose yours with custom image upload from TicketPrinting.com.